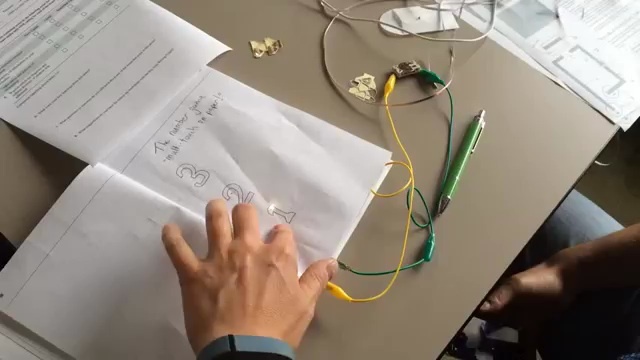 Though the July 9th Hack Your Notebook Day event is over, workshops and explorations in paper circuitry continue -- see the information below for a look at what our basic notebook hacking kit looked like for Summer 2014's events. This was a complete collection -- including Chibitronics Circuit Stickers, sewable battery holders, clip leads, conductive thread, darning yard for custom leads, batteries, etc.. Working with CV2 we offered this collection for 20 participants for $425.00. In the spring of 2015 we're offering starter kits with a printable 11x17 template and an A3 version for metric countries. Find an early version here that was created for a workshop session in Santa Rosa, CA with and the Sonoma County Office of Education; here's the same layout with a blank worksheet area. These collections use 3v Lithium batteries with solderable tabs -- they're low-profie, letting you integrated the battery easily on your paper project -- and if your want to solder them in place, no problem. Each kit comes with clip leads, batteries, circuit stickers from Chibitronics and a roll of copper tape. What kind of learning experience does simple collection this support? Low floor, high ceiling, wide wall learning experience. In 2009 Mitch Resnick, the Director of MIT's Lifelong Kindergarten program, members of his Scratch Team, along with Yasmin Kafai from the Univ. of Pennsylvania and Brian Silverman from the Playful Invention Company in Montreal, published "Scratch: Programming for All" in which they comment about the learning and engagement model that happens with open-ended design projects. Referencing the work and thinking of Seymour Papert, they commented that, "programming languages should have a “low floor” (easy to get started) and a “high ceiling” (opportunities to create increasingly complex projects over time). In addition, languages need “wide walls” (supporting many different types of projects so people with many different interests and learning styles can all become engaged)." Daie Dougherty has commented, accurately and tongue-in-cheek, "that the blinky LED is the gateway drug for making. Try out these materials and learn how easy it can be to get busy with self-directed, interdisciplinary learning. Want to organize your own materials? Visit nexmap.org/notebook-materials for alternate sources. Hacking your notebook means personalizing it, making it uniquely yours. Our Hack Your Notebook Day kits contain everything you need to get started with adding paper electronics to your notebook but you can further support the creative and artistic exploration involved by providing additional supplies to your notebook hackers. This is not meant to be a comprehensive list—you know your audience best! Pick and choose what materials make sense for your participants, time frame and available resources. Have ideas for cool materials that aren’t listed here? Contact Jen at NEXMAP (jen -at- nexmap.org) so she can add them to the list! Hey, notebook hackers! V.2 of our four notebook hacking activity pages are now available for download. Please review before your event and share any feedback you have with us so we can get these as tuned-up as possible for Hack Your Notebook Day. Click images to download the PDF of each activity.